High blood calcium due to hyperparathyroidism is well known to cause "psychiatric" problems. It's part of the classic "Bones, Stones, Groans, and Psychic Overtones" that was coined in the 1950's. Fatigue (chronic fatigue) is the most common symptom of hyperparathyroidism. But depression is the most common psychiatric symptom and it is caused by high blood calcium (calcium over 10.0 mg/dl; 2.49 mmol/l in an adult). Read this amazing case where illustrating that anger and fits of rage can be caused by hyperparathyroidism. Have anger management problems? Depression? Chronic fatigue? Better check your blood calcium levels! Today we operated on a 40 year old man from New Jersey. Although Robert is only 40 years old, he had open heart surgery last year with coronary bypass because his heart arteries are prematurely plugged (by calcium deposits!). He has been treated for chronic fatigue and depression on and off for the past 10 years, but not in the past 2 years. Robert's current problem is that he is having increasing troubles at work, with frequent bouts of anger and occasional rage directed towards other co-workers and sometimes clients. His wife left him 2 years ago because of his anger problem. During the divorce she told him "You've changed! You are not the loving man I married 14 years ago. You are angry, crazy, depressed, and mad all at the same time!". Robert was ordered by his employer to enroll in anger management classes. Of course, he couldn't believe he was in the same class with "losers who are trying to kill their boyfriends". LOL! Lucky for Robert, after 2 months of anger management classes he had a kidney stone while attending one class. He was 40 miles from his home and his urologist who has operated on him 4 times over the past 10 y ears for kidney stones. Thus he went to a NEW doctor at a NEW hospital across the street from the anger management class. The new doctor immediately says "Hey, what the heck is going on? Your blood calcium is 12.6! Is your calcium always this high?" Robert is slowly dying of a parathyroid tumor and hyperparathyroidism. It is destroying his kidneys with lots of stones, and is destroying his heart arteries causing him to need cardiac surgery with a bypass and stent while only 39 years old. This parathyroid tumor is also destroying his personality and his personal life. It has cost him his marriage, and it is about to cost him his job. Robert doesn't need anger management classes. He doesn't need medications for depression. Robert needs a parathyroid operation to remove the tumor that is causing the high blood calcium which in turn is causing his psychiatric problems! He has been labeled "bipolar" by his newest psychiatrist who never checked any blood tests. He was given lithium for two years which didn't help, so they took him off of lithium and put him on Prozac. In the meantime, he sees a cardiologist who writes this in Robert's chart: "We will continue to monitor his high blood calcium. I am not sure why the calcium is so high. I told him to stop eating cheese and dairy products." WOW! I guess this cardiologist doesn't have a phone or access to Google. Huge parathyroid tumor that was ruining Robert's life. Removed by Dr Norman in 16 minutes. The other three parathyroid glands were checked and were small and perfect, not making any hormone. He went home 45 minutes later CURED! The sestamibi scan above shows that Robert has a normal thyroid, and a huge left lower parathyroid tumor (remember that when we look at all forms of x-rays and scans it is oriented like we are looking at the patient, so the left is on the right and the right is on the left). The operation took 16 minutes. Robert had three small normal glands and this huge parathyroid adenoma (one of the top 10 largest I have ever seen). He went home 45 minutes later ready to put his life back together. Yes, he still loves his wife, and we gave him an extra copy of the picture of his tumor-he is going to put the picture into a card to the love of his life and explain to her what has happened, and what parathyroid tumors do to people. 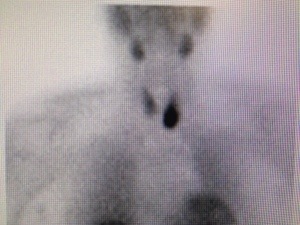 This parathyroid adenoma is 15 years old. Robert has had high blood calcium since age 28 when it was 11.0 mg/dl. Nobody seemed to notice and when some doctor did recognize it, they didn't know what to do, so they did nothing. This is typical of many doctors, when they don't know what to do, they do nothing-instead of asking for help or using the new invention called "the internet". 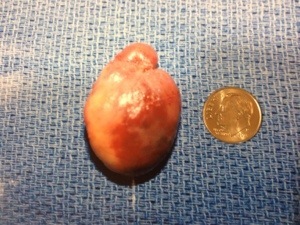 This tumor (and the high blood calcium that it caused) was the reason why he had heart surgery at the age of 39, and the reason why he has had 4 operations to remove kidney stones. It is why his wife saw his personality change and why his employer was on the verge of firing him. Hyperparathyroidism kills people. It takes away the "joy of life". Do not ignore high blood calcium. Bad things will happen-they ALWAYS do! We changed Robert's life today, and it took us 16 minutes. I just wish we could have done it for him 10 years ago. Watch a video of Dr Norman performing a complete, 4-gland parathyroid operation in MINI fashion in less than 13 minutes. Make sure your surgeon checks all four parathyroid glands or you may not be cured!